Having a garden with not much space means it’s difficult to start seeds growing when the weather is slow to warm up. For this reason I had been looking for something I could use for indoor planting that wasn’t a brown or black plastic seed tray that looked like it belonged in a shed. Then I found the perfect thing! A mini greenhouse from Ikea – and for only £12. Everything you need comes flat-packed in one box and you can put it together in minutes with no tools needed. The greenhouse has a white steel frame that measures 45cm wide and 35cm high with a depth of 22cm. Within the frame you slot the plastic sheets that make the house. The frame then fits into slots on the tray base. On this I’ve been able to fit seven small pots. 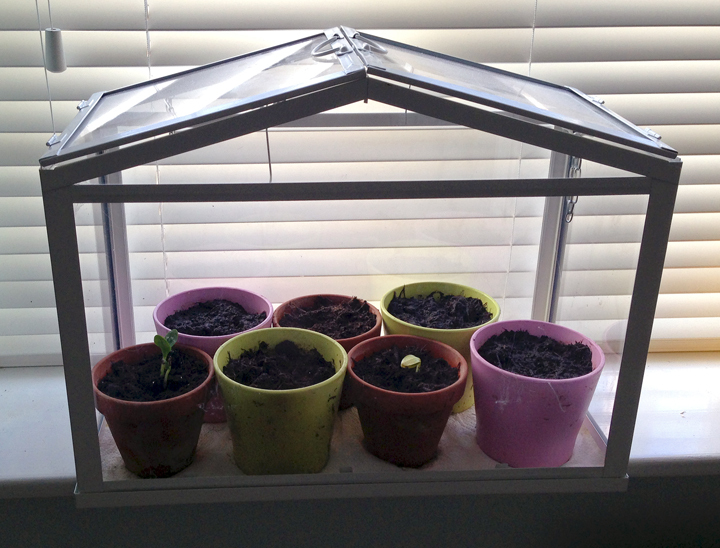 Once you’re all set up, you can open or close the top windows – handy for getting in there when it’s watering time. And you can leave them propped open if you want to give your seedlings some air. It does the job and it looks pretty good, too! This year, I have never eaten so many chillies in my life! I’m throwing chillies in to nearly everything I cook. I can’t seem to get enough of them, so it made sense to try to grow my own. Then I tried to break habits of a lifetime by planting these things properly! I bought some compost that’s suitable for growing seeds and put one seed in each hole the recommended distance apart (details given on the back of the packet). This is not my usual planting style, which would generally include scattering the whole packet in! Planting properly now means any seedlings have a better chance at life – and I have some seeds left for a future sowing. I planted the seeds into pots on a windowsill greenhouse that I got from Ikea. The green pots had the Jalapeño, the pink pots had the Scotch Bonnet and the terracotta pots had the Cayenne – colour coding was the best way for me to remember which was which! Once the seedlings emerged and looked strong enough, I took out the lesser specimens to give the better ones more room. I didn’t have the heart to throw away the ones I’d pulled out, so planted them into pots in the garden just to give them one last chance! When the greenhouse started to get leafier, and the plants looked strong, I created my chilli garden against a wall with a range of larger pots – their final homes. I ended up with three Jalapeño, four Cayenne and four Scotch Bonnet. 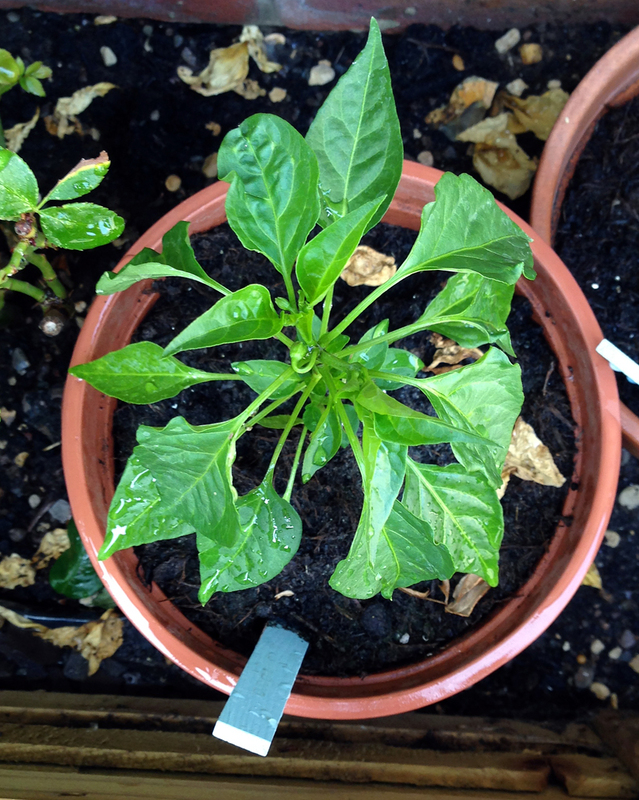 It’s many weeks later now and the plants are all going strong, except for two casualties… Two of the Scotch Bonnets have been munched right down – by what? I haven’t got a clue. Looking at the plants today, I can see the start of some flowers, which of course had made me a little more excited than it probably should! So, fingers crossed that I’ll be able to come back soon and show you a colourful crop! 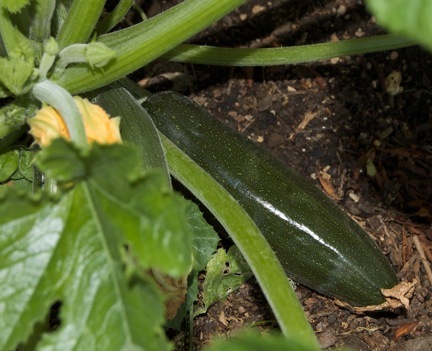 This year in my tiny garden I am growing courgettes (zucchini) for the first time. One solitary seedling was planted in mid May and this is what it looks like today. Take a closer look and you’ll see at least five green protrusions – all different sizes and shades. One of them even looks like it’ll be ready to eat next week! Looking forward to that. Now I just need to find some recipes . 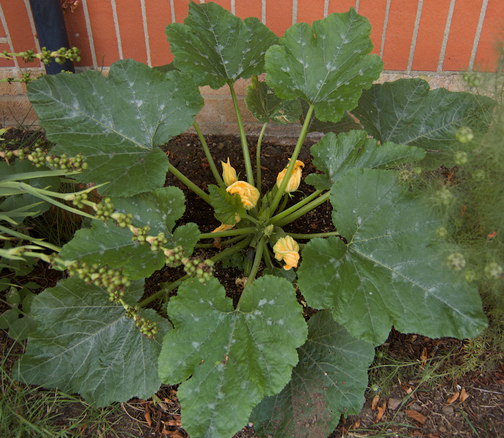 . .
UPDATE (15 Aug): Eight lovely courgettes eaten so far and my solitary plant is the plant that just keeps giving – there’s at least four more coming along nicely. 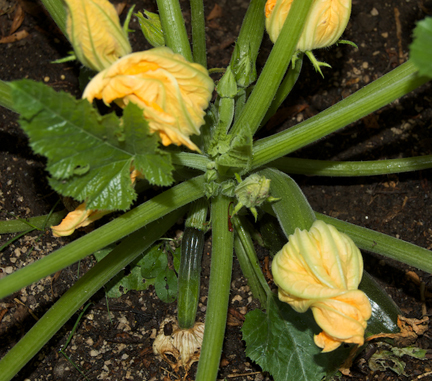 It conveniently readies the next courgette several days after the last, so they’re not all ready at once. I will definitely be saving a space for Mr Courgette next year! It’s amazing how fast radishes grow. This YouTube video brilliantly captures the germination and sprouting process. The camera was set to take one frame every 14 minutes, 24 seconds over 9 days. The last time I photographed the progress of my radish seeds was 13 days after planting. 29 days later, this is the result. The seedlings pictured in the previous photo have gone to the great vegetable patch in the sky after being dug up by one of the animals in the neighbourhood. Luckily I planted two rows. I have been so concerned with finding ways to discourage animals from the radish patch that I neglected the next crucial stage in seed growing – thinning the seedlings out. My efforts on the animal-front seem to have been quite successful though. First I put down some twigs, which worked fairly well, although some of the radishes still got dug up – and while less pooh appeared after that, I did notice a few poohs of both the fox and dog variety (the things you learn growing up in the country!). My next plan of action was to put down some used, dried tea bags each with several drops of Olbas oil. I was given this tip by my mum who took it from a calendar. I don’t think I’ve seen any excrement since I put the tea bags down. I do have to refresh the Olbas oil every now and then, but at around £2 from my local supermarket, this is cheaper than any ‘Dog Away’ type products you can get in the garden centre – and hopefully it’s more gentle on the ground. Since I took this photo, I have thinned out the weedier plants to give the stronger ones more space to grow – I hope it’s not too late . . .
A couple of weeks ago I reclaimed some planting space in my small garden when a tree fell over due to the weight of snow. Excited at the prospect of growing some food, I headed to the garden centre and returned with packets of radish, carrot, lettuce and chive seeds in my grubby paws. I haven’t had much luck with seeds in the past. I think I’ve gone wrong by planting the seeds too low and not watering them enough. Determined to do the right thing this time, I got out some tools and started to break up the soil, only to unearth poop upon poop of cat excrement with fresh dollops of dog poop on top. How disappointing – my tiny patch of land appears to be the local pet potty. My seeds will have no chance of survival if I put them in only to be dug up by poopers. Disheartened, I replanted some spiky plants that were overgrowing round the front into the potty area, and planted some seeds in the patches in between. Remembering not to plant the seeds too low, I dragged the tip of a cane in the soil to form a little trench about half-an-inch deep, sprinkled in the seeds and covered them up. At this point I phoned my parents who suggested covering the seeded areas with twigs as ‘animals like soft soil on their bottoms’ and wouldn’t like the feeling of the twigs. Twigs duly placed I got out the watering can and gave the seeds their first soak. How Long Will the Seeds Take to Grow? Now . . . I don’t have high hopes for my seeds at the moment. I will be so excited if they germinate and if they grow into anything edible it will be a miracle! If anything grows, the radishes will be the first to appear. They take 3–6 weeks to grow. The lettuces may appear in 9–11 weeks and the carrots in 12–14 weeks. I won’t be inviting anyone around for salad just yet, but keep your fingers crossed for me and watch this space! Vegging Out is a blog for all things natural, local and nutritionally good, including seasonal food, local food, nutrition, recipes, bees, crafts, gardening and composting. Video… Save the Bees and Dance! Play this game and points mean rice to the hungry!